The WARPDRIVE series is a digital, compact and cost-effective servo drive solution for all kind of profile cutting machines. The WARPDRIVE series offers excellent servo properties such as high dynamic range, high precision, high efficiency and low heat generation. Up to three axes in one housing saves space in the control cabinet and achieves an optimal price/performance ratio. Welcome to the Digital Age! The new digital AC Servo System represents the evolution of servo technology, delivering smooth, accurate motion that has many advantages compared to traditional analogue or SERCOS servo systems! Whether it be for a simple 2 axis machine, or an advanced multi-axis machine, the high speed digital connection to the Infinity CNC ensures each axis of motion performs perfectly! The WARPDRIVE offers flexibility with a wide power range and large selection of motor sizes, so a package can be customized to suit any machine. 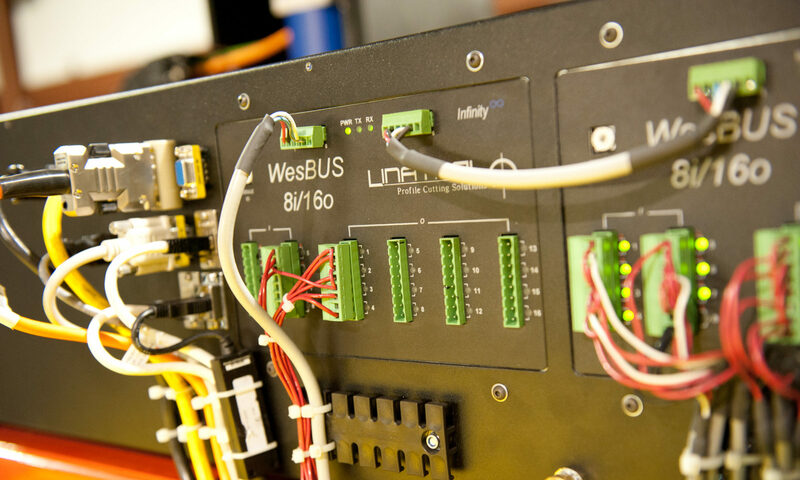 WARPDRIVE uses a high-speed digital interface to Infinity CNC by a Synchronous Serial Interface (SSI) for superior motion control. WARPDRIVE is offered in standard 1kW or 2kW drive packages in either 2-axis or 3-axis configurations suitable for most cutting machines. WARPDRIVE is modular, so a single cable connection between WARPDRIVE amplifiers makes it fast and easy to expand a system up to 16 axes. WARPDRIVE Motors are available in many sizes and windings to match torque and power requirements of the target machine. WARPDRIVE uses a robust resolver feedback system for standard applications, and absolute encoder feedback systems are optional. WARPDRIVE provides a fully integrated setup utility on the Infinity CNC with graphical “scope” tool that allows the user to optimize motion on any machine. WARPDRIVE features industrial grade shielded flex cables with metal motor connectors to ensure years of reliable service. WARPDRIVE is offered with high quality planetary gearboxes to deliver excellent performance value. WARPDRIVE is backed by one of the best warranty programs available.